It’s October, and rattlesnakes are as active as ever. They’re moving around a lot right now, getting in some last meals, mating, and general rattlesnake “housekeeping” as they get ready for cooler months. This is also the time of year they begin to move back towards where they will spend the winter. Unfortunately for many homeowners in Arizona, that means your house or property. 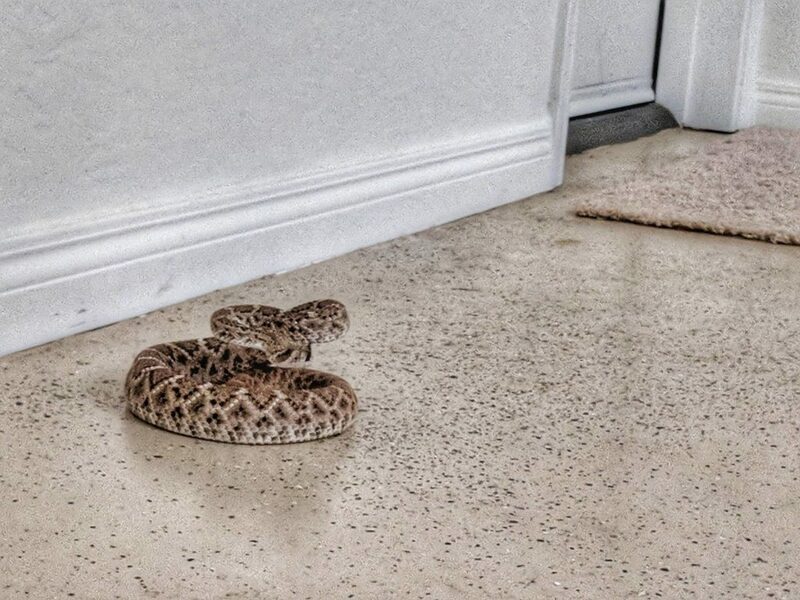 Rattlesnakes can and do overwinter in and around buildings, so how can you prevent your property from being a rattlesnake den? Before going into the details, I should specify that this information may really only be completely relevant in the Sonoran Desert portions of Arizona, particularly Phoenix and Tucson. It’s also a lot of good general advice, but be aware that the further you are from saguaros, the less accurate it may be for your situation. The rattlesnake species that most-often comes into conflict with people is the Western Diamondback Rattlesnake. They’re generalists that make good use of the desert landscaping found at most homes on the outskirts of Phoenix and Tucson, and the species that I’ll be referring to in this article as “rattlesnake”, despite the several other species that also occur in these areas. How rattlesnakes den for the winter in the Sonoran Desert is a bit different than in other parts of the country, or even other parts of their range within Arizona. In the lower, hot desert, it just doesn’t get cold enough in the winter to create a need for a lot of fuss over finding a perfect den. You may be familiar with photographs online of dozens or hundreds of rattlesnakes pouring out of a hole in the ground, usually with some silly comments. These are actual and accurate photographs, but from cooler climates where rattlesnakes may have fewer preferable areas to select from, during the longer and colder winter. Here, where we may only get a handful of nights each year with sub-freezing temperatures, sun exposure everywhere, and countless rock piles and tunnels to choose from, snakes have it easy. This means that they tend to den in smaller groups, perhaps only a few individuals, or even alone. While some larger dens do certainly exist in some places, with 20 or more individuals, this is not as common as the smaller sites. 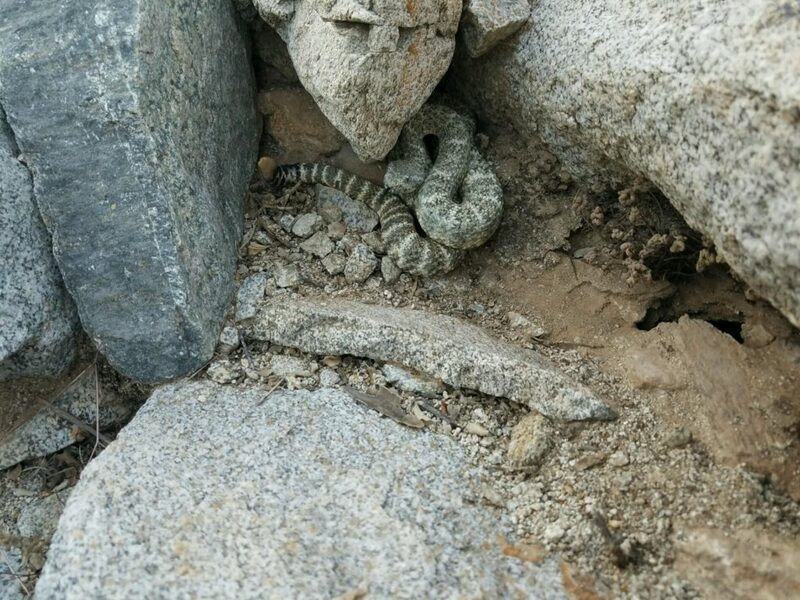 Other species, like Speckled Rattlesnakes and Tiger Rattlesnakes, tend to den in a general area rather than a particular crack year-after-year, so avoiding the creation of an accidental den can be challenging. A primary driving force for choosing a den site appears to be the preservation of moisture, rather than sun exposure and access to heat [Hamilton, Nowak, Western North American Naturalist 69(3):319-328. 2009 ]. That means that a rattlesnake den in much of Arizona isn’t just some high rocky hilltop, but can be really anywhere at all. They may use different dens in different years, and are generally less predictable than in cooler climates. Do rattlesnakes den at homes? The Rattlesnake Solutions relocation hotline largely stops ringing in mid-November, after the snakes have completed ingress (moving into the den area they’ve selected). After that, we still get calls, but they are of a different nature – they are denning rattlesnakes. The places where we have found them over the past decade and the conditions they appear to be drawn to are consistent enough that we have a good idea of which features at a home are likely to become a rattlesnake den without some consideration. To a rattlesnake a garage is just an insulated cave with some golf bags and fishing gear. 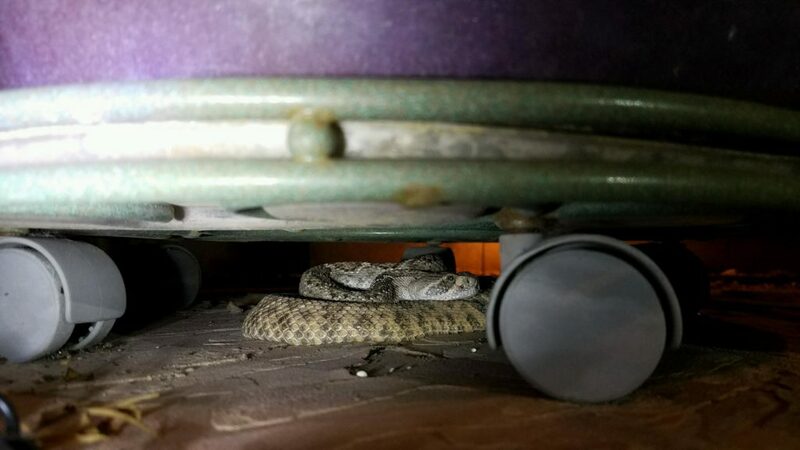 By far, the most common rattlesnake den situation we find at homes in Arizona are storage areas in the garage. Typically, they are discovered in the early Springtime once the snakes tend to move towards the front of the garage, and are found coiled in the corner near the door. Upon inspection, these are almost always snakes that have apparently spent the entire winter in the garage (the homeowners usually don’t like this news). They tend to use areas where boxes or other storage comes in close contact with the wall. This description probably fits most garages (including mine), but long-term storage with poorly-sealed boxes seems to be the most common and useful situation for rattlesnakes. Cardboard boxes that contain holiday decorations seem to be commonly used as a dens, as they provide some cover and additional insulation. 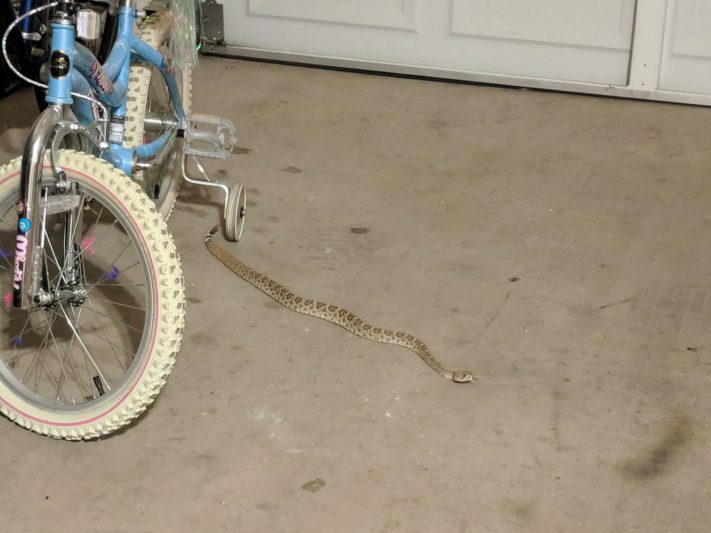 What can you do to keep your garage from becoming a rattlesnake den? Make sure the garage door is in good shape and tightly sealed, especially at the edges and corners. Fix any cracks in concrete and vents that lead to outside areas. Keep the garage door closed as much as possible, even during the day, especially during the ingress period of October-November. Keep the garage clean and move long-term storage to other areas. Close access to any built-in closets, water heater areas, equipment rooms, etc. Watch for signs of rodents (droppings, nesting material) and get rid of them if rodents are found. 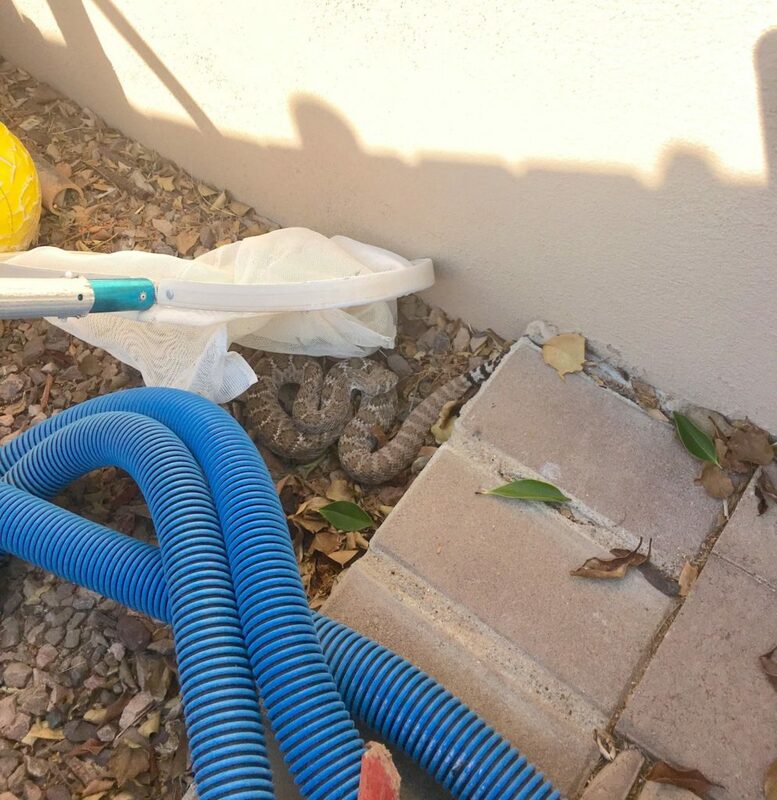 A swimming pool is an extremely common feature at most homes in the Phoenix area, and it’s no surprise that rattlesnakes will make use of the often-overlooked pool pump and equipment area. These pump and filter areas are usually closed off and alongside the home, or otherwise separated from the rest of the yard. They’re also less often-visited than other areas of the property, so can get a “pass” on rodent activity and are generally less tidy than other parts of an even manicured yard. 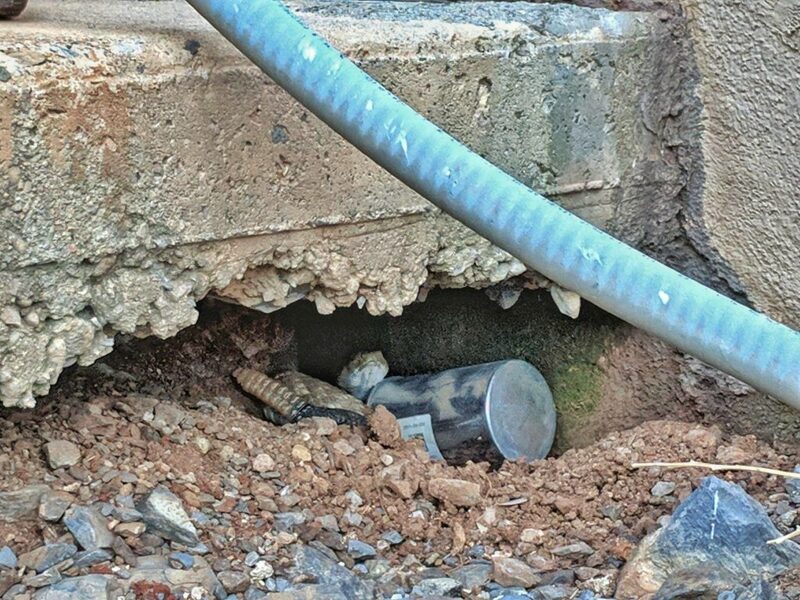 In the winter, a common place for rattlesnakes to den is under the concrete base of the filter unit or other pump equipment. Rodents and erosion, along with the generally-higher humidity near the pump equipment and vibration, create caves and spaces that rattlesnakes apparently love. Each year, we receive numerous calls to relocate multiple rattlesnakes from situation. What can you do to keep your pool pump and filter area from becoming a rattlesnake den? Control the rodent population and make sure that any tunnels or digging is addressed immediately. Keep the area clean and do not store anything there that isn’t necessary. Any clutter, buckets, bricks, and other things that tend to be stored in these areas can increase your chances of seeing a rattlesnake here. Seal the entrance to the pool equipment area with a gate, then have rattlesnake fencing installed onto it. Fix any cracks in the concrete pad and eliminate any spaces possible in the surrounding walls. The third most common situation where we find rattlesnakes denning are rock piles and rip rap placed as decoration on the property. In many of these situations, the rock piles are placed in areas where they also come into contact with the surrounding landscaping. If this is done in a particular way, it can create a perfect situation for rattlesnakes looking to hide for the winter. More specifically, rosemary bushes or other large, low cover that tends to create deep leaf-litter that is allowed to grow over the top of rock piles, where the rocks are the size of a cantaloupe or larger, and are piled to a depth of more than 20″. If there is water nearby (drip system, pool, etc), this is even better for the snakes. If this all exists on a slope or at the edge of a wash, you should be surprised if rattlesnakes are not using it already. Each year we capture rattlesnakes in these situations, and more often than not, there is evidence to show that the snakes have been using these areas for a long time. What can you do to keep your landscaping and decorative frock from becoming a rattlesnake den? Keep plants and bushes trimmed back from the edge of the rock, and never let it grow over the top of or through the rock pile itself. Make sure that decorative rock piles do not have deep spaces and are as shallow as possible. Watch larger boulders for rodent activity and tunnels that may create spaces under them. If tunnels are found, use a garden hose to flood them and destroy them from the inside-out. Seal spaces and crevices between larger rocks with concrete (or similar) so that access to the interior, protected area is eliminated. Consider removing any plants or rocks in the property that you do not feel adds to the appeal to the property, or that you’re “on the fence” about keeping. Generally and unfortunately, a boring yard is a safe yard. Be sure not to add superfluous features. The fourth, and most common in many areas, place where rattlesnake dens are frequently found are underneath homes themselves. This is typically most common in areas where manufactured homes are numerous, where the aluminum or wood skirting that lines the space under the home is easily breached by rodents and general wear and tear. In larger homes with a solid foundation, the situation can be even more difficult to solve, since the crawl spaces leading to where the snakes den can be difficult for a tall snake relocator (ahem) to fit into. We are often alerted to these dens by Air Conditioning repair technicians, who see a shed skin and refuse to crawl any further until it gets checked out. Fortunately, even though this can be relatively common and difficult to handle, it is relatively easy to prevent. 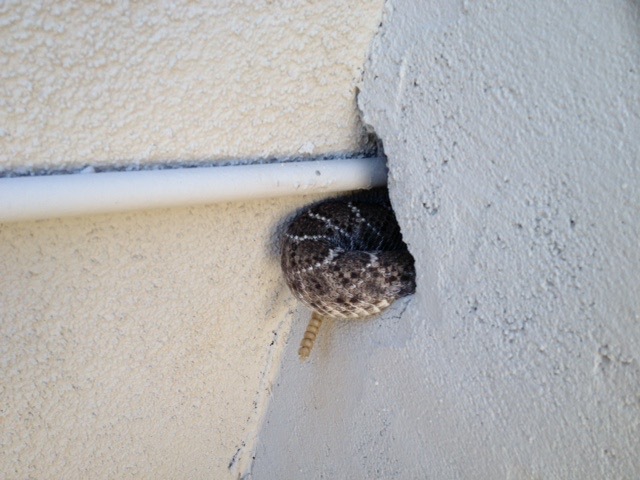 How can I keep my house from becoming a rattlesnake den? Seal all cracks in the foundation, no matter how small or minor they appear to be. Even cracks that are too small for a rattlesnake to fit through may widen over time, and it is best to fix them as they are found. Watch for any signs of erosion or digging by rodents at the edge of the home. If these holes go under the foundation, you’ve created an insulated and safe cave for rattlesnakes to use. Have a zero tolerance policy for any rodent activity at the base of the foundation. Be aware of spaces in the flashing or spaces at the corners, pillars, and other joints where the stucco frame meets the foundation. Modern home construction seems to be less-than-concerned that the house is sealed properly. We commonly see gaps in corners, even completely open overhangs that can lead up and over the foundation itself or into the walls of the home. Do whatever needs to be done to fix this. A place where we regularly find rattlesnakes denning on a property is under a backyard shed. These structures are almost always less-maintained than the home itself, and have a variety of foundation types, even just plopped onto the dirt on a few cinderblocks. Unfortunately for us, these are perfect conditions for rodents, and the predators that eat them. Rattlesnakes can move into the spaces under the shed and be relatively undisturbed. Of all of the den conditions described here, backyard sheds seem to offer the most long-term refuge from winter cold, according to the number of shed skins and even dead snakes that we find there. Sometimes rodents even dig up into the shed itself and find additional cover opportunity in the stuff stored in there, which usually gets even less attention than boxes stored in the garage. How do I keep rattlesnake from making a den under my shed? Watch for any rodent activity and do what you can to eliminate it. Put the shed on a foundation or support structure of some sort that does not allow gaps and easy access. Use heavy materials and avoid things like particle-board, cheap plywood, and things that a rodent can easily get through. Schedule a yearly cleanout of the shed itself to keep things clean and review items to possibly cut down on the amount of clutter stored inside. Keep anything that can be eaten out of there – birdseed, dogfood, grass seed, and other edibles are often kept in these sheds, and can attract rodents (and rattlesnakes as a result). If the shed is build near a wall, make sure to clean out the space between the wall and prevent landscaping debris from piling up there. This will be the last potential rattlesnake den situation that is covered here. It’s a little bit less common than the others, but its nature and tendency to put sandal-wearing or bare feet in close proximity to rattlesnake fangs makes it worth noting. At many homes in the Phoenix and Tucson metro areas, a stand-alone grill island is a standard feature. The trouble is, all those burger drippings and hot dogs that slip through the cracks can attract rodents, and once again, rattlesnakes who are looking for them. These islands usually have an access door on one side, and at least one vent on the rear side. Some also have inlets for propane stored elsewhere, or even extend into other features like a bench. The construction of these islands is usually flimpsy and tends to fall apart at the corners relatively quickly, leaving easy access for hungry rodents and one-stop-shopping for rattlesnakes in search of a place to hide away for the winter. How do I keep a rattlesnake den from forming under my grill? Keep the access door closed at all times and make sure that it latches tightly. Cover vents with 1/4″ steel hardware cloth mesh. Completely seal all cracks that may appear in the stucco, and make sure that any interior openings for access to propane and other pipes is sealed entirely. Keep it clean! If you see any rodent droppings under there (like a squishy brown tictac), you have rodents running around the area where you make your hamburgers. That’s not only gross, but a potential attractant for rattlesnakes. Have your entire yard sealed properly by having rattlesnake fence professionally installed. Don’t let your guard down just because it’s cold outside. Rattlesnakes in Arizona are active all year. A term that people throw around and the local news loves is rattlesnake “season”. This implies that rattlesnakes show up at some point, stay awhile, and disappear – and nobody has to worry about it until rattlesnake “season” starts up again! This may be true in some places where ice-scrapers are sold, but here in Arizona, rattlesnakes are active to some degree every month of the year. They may not be traveling or hunting, but if they definitely will come out on a sunny day or after a rain even on cool winter days. No matter if you have one of the above feature or not, the greatest rattlesnake den advice I have to give is to continue to follow the rattlesnake safety rules as you normally would. Don’t reach where you can’t see, clean up messes as you make them, get rid of rodents and clutter, and so on. 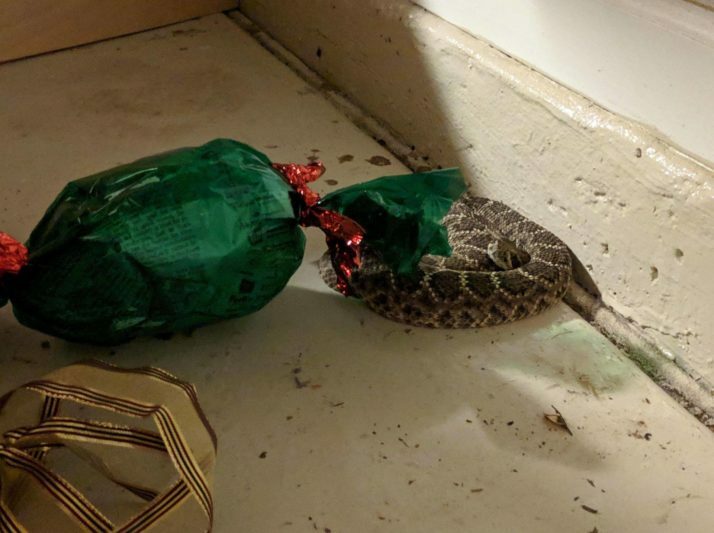 Just because it’s cold out doesn’t mean you can’t meet a rattlesnake, and if you’re sharing a garage with one, that could be any time at all. If you have any rattlesnake den stories or have found one at your home, or you have questions about any of these features and want more information about what you can do to help keep a rattlesnake den from showing up at your place, contact us.